Tyrannosaurus rex, 1.8" long X 1.1" tall. 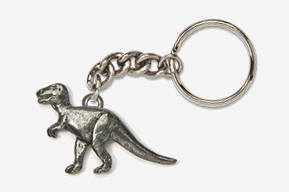 This sculpted Pewter Tyrannosaurus Keychain is expertly crafted into functional carniverous Dinosaur art, sure to please the bipedal, apex predatory T-rex enthusiast. Our especially detailed Keychains are cast in lead-free Fine Pewter with a chain and split ring (as shown) to hold your keys. All designs © GG Harris. These same castings also make great Pendants and Zipper Pulls. If requested, optional hardware above is included without charge. Be sure to select at right.